Looking back at the history of the names humans used to refer to the dodo, you can appreciate that we didn’t care all that much for this bird during our brief period of interaction with it. So there’s dodo, which Etymonline claims comes from the Portuguese doudo, “fool, simpleton.” I’m unsure whether they called it this as a result of the way it looked — remarkably like one of my gradeschool teachers, I’d like to point out — or how it lacked any natural fear of humans and would just trot right up to whatever sailor arrived onshore. It’s probably a little bit of both. [F]inding in this place great quantity of foules twice as bigge as swans, which they call Walghstocks or Wallowbirdes being very good meat. But finding an abundance of pigeons & popinnayes [parrots], they disdained any more to eat those great foules calling them Wallowbirds, that is to say lothsome or fulsome birdes. Yes, “wallowbirds.” Not exactly a testament to the dodo’s appeal. Others? Wikipedia also notes dronte, meaning “swollen,” and kermisgans, “in reference to the birds fattened for the Kermesse festival,” according to Cheke and Hulme’s 2008 book Lost Land of the Dodo. The poor dodo even gets dinged on the level of its scientific name: After the bird’s extinction, Carl Lineaus named it Didus ineptus, literally “inept dodo.” The current scientific name is Raphus cucullatus, which I’m happy to report is not a ding against the bird’s mental faculties or physical appearance. Poor dodo. We should have maybe been a little nicer to you while we had the chance, and also then maybe we shouldn’t have introduced all those invasive species that made you die. 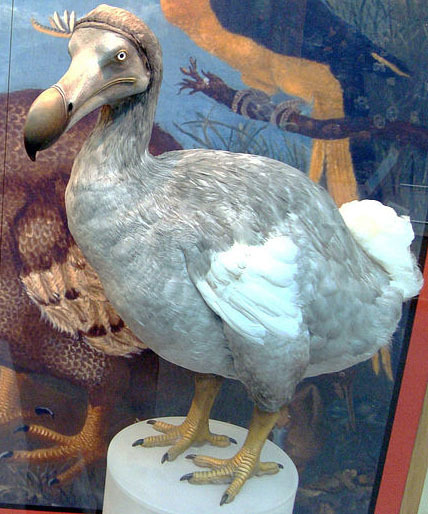 But in defense of all the name-calling: take another look at that photo of the dodo exhibit. You have to admit: If that face is at all representative of what it looked like in life, it didn’t appear to be having a great time. My GOD the word "ill" looks terrible in a headline. This is the follow up to Speaking II of the Extinct and prequel to Speaking IV of the Extinct, right? Oof. Yes that does indeed look terrible. I shall not do this again. I was reading this in Google Reader, and the advertisement inserted at the bottom of your blog entry was for the game Angry Birds. That is actually kind of awesome. I'd imagine the content of the post itself called for the ad, yes?